Man, oh man, remember college? Those were the days. I remember staying up all night binge reading, and flirting (in my head) with librarians. Oh, and weekends. Oh boy, that’s when I’d come alive. I could binge read two whole books on a really good weekend. Wild times. Also, I had tons of friends. Anyway, if you didn’t already, these magnificent university libraries will make you ache for your glory days. 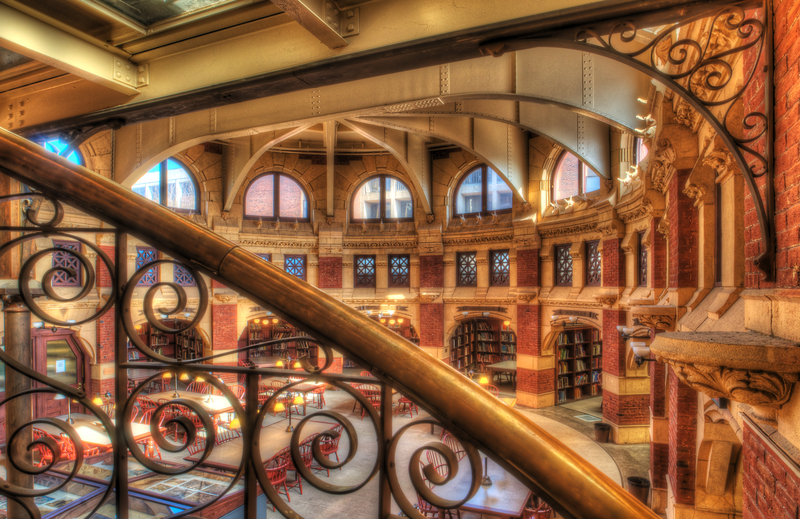 Containing over 300,000 books, the George Peabody Library dates back to 1857. It’s a towering stack of historically significant and rare books. Also, you can get married there. And you should, and invite me. Having opened in 1891, Cornell’s Uris Library looks very much like a 19th-century construction. More specifically, it looks like the sort of place you’d find Charles Dickens poking his head around, or maybe Emily Dickinson hidden in the stacks. It looks like you could suffocate in the books, which is the way I want to go. The University of Washington’s Suzzallo Library is not only home to one of the world’s largest books—the Bhutan Book, whose pages are turned once a month by library staff—but also to one of the coziest-looking reading rooms on the planet. Doesn’t it make you think of Hogwarts? This 1891 library has long attracted the attention of architects. Frank Lloyd Wright once said of it, “It is the work of an artist.” It is in fact, having been designed by celebrated Philadelphia architect Frank Furness. The reading room is designed to allow an enormous amount of natural light in, and I’m sure the students appreciate Furness’ foresight. Having opened in 1934, this gorgeous library cost only $4 million to construct. It was during the Great Depression, after all. Containing 2 million books, this library makes me wish I had been smart enough to get into Columbia. Standing out from the crowd, Loyola’s Lake Shore campus in Chicago is home to the extremely modern Klarchek Information Commons (the IC). It opened in 2008 and is notable for its scenic location. It gives library-goers the opportunity to overlook Lake Michigan from the comfort of their fully-furnished reading space. I’m jealous. Hale Library looks like a sort of rural paradise. The bright stonework and differently-shaped roofs (I’m not an architect) make it look like a kind of mirage you’d stumble upon scouring the hillsides of the midwest. Maybe a nice country couple will welcome you in for a nice cup of joe and a bowl of grits. I don’t know, I’m doing my best here. It’s a nice library, in any case. This one opened in 1931, just a year after famed lawyer William W. Cook’s death. He had not wanted any buildings on campus to be named after him, but since he died before the library’s completion, the university decided to ignore his wishes. Yikes. The Louis Round Wilson Library served as UNC Chapel Hill’s main library until 1984, but it still houses several special exhibitions. As of right now, they are currently exhibiting “Sounds of ‘68: Revolution in the Air,” where they are displaying classic LPs from people like Frank Zappa and Aretha Franklin. Groovy. The most modern library on the list, Joe and Rika Mansueto Library opened on UC’s campus in 2011. From the outside, it looks kind of like a gigantic robot cockroach, but in a good way. From the inside, it looks like an enormous, naturally-lit reading area. That’s what you’d hope from a good library.